I sometimes think I'm the only one who wonders about bizarro things like if the Blue Wiggle is hot in real life* or what the hell happened to the redheaded girl from the Fresh Beat Band? Do you ever wonder about things like that, too? Obviously, I have young kids and we watch TV and I have no life. Don't judge me. Recently I noticed that a bunch of kids shows that I haven't seen in a while are back on the air. Like Charlie and Lola - YAY! 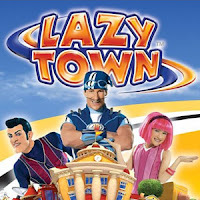 Also, LazyTown. You know about that one, right? It used to be on Nickelodeon about 5 years ago, but now I think it's on somewhere else and it's has a couple of humans in the cast (including a lovely little girl) but it's mostly profoundly disturbing puppets. 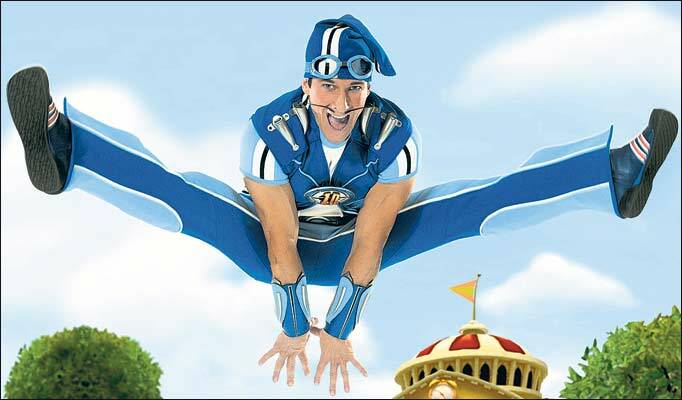 The other humans are Sportacus (the hero, who wants everyone to exercise and not eat candy) and Robbie Rotten (the villain, who just freaks me out beyond measure). And your comments cracked me up. Because it turns out I am not alone in thinking about these things. Now, I'll be 100% honest - the show has a great message and I totally understand why people like it. I just think it's scary because I'm mentally unbalanced. 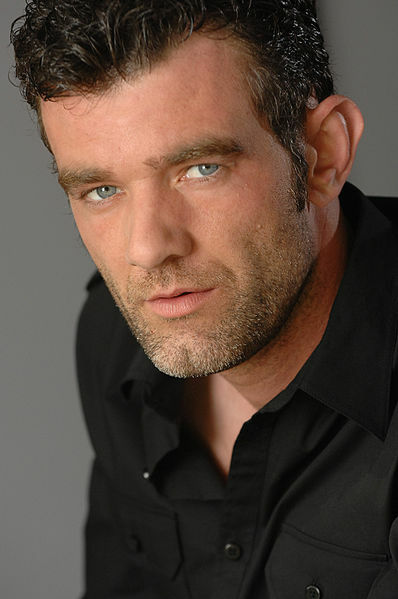 And my weirdometer goes off when I see any of the LazyTown characters (expect for the little girl, who as I said before is adorable. But I worry for her. All alone in that town full of scary puppets). This is all magnified by the fact that when the credits run, it appears that the dude who plays Sportacus (Magnus Sheving) pretty much runs the show behind the scenes, from producing it down to making the coffee. And practically every shot on the show is of his nether regions in snug-fitting track pants. 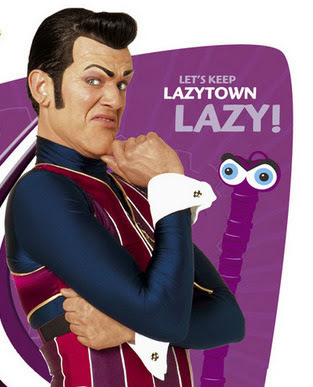 So of course, because I'm a total whack job and your comments hinted on him having some neat backstory, I'm all: "I MUST GOOGLE EVERYTHING TO DO WITH LAZYTOWN RIGHT NOW." And also, laundry needed folding so this was a much better use of my time. That sweet girl who was in the show with the pink hair is now attending an excellent 4 year college and learned fluent Icelandic while filming the show on location in Magnus's homeland. Good for you, sweetie - far away high five! So here's what I'm thinking. Now that I've found out more about LazyTown, I need to find out what's going on with the red haired girl from The Fresh Beat Band, because something happened there. Let's hope it's interesting. Maybe the position of "red haired girl in the Fresh Beat Band" is something akin to "Spinal Tap drummer". Who knows - I sort of hope not because she seemed very nice and I would hate for her to have died in a bizarre gardening accident. Also? I want to know how the yellow Wiggle is doing, the one who got sick and had to quit. And you know what else? I want to find out why no Bubble Guppies songs are available for download on iTunes. I mean - what is the point in writing an ear-worm melody that is played 10,000 times if I can't put it on my damn iPod? So, if you have any questions like this - and you want me to get you some answers - leave them here for me in the comment section. I WILL NOT LET YOU DOWN. Unless a Google search doesn't yield anything in which case, sorry but I probably will let you down a little. *The Blue Wiggle is very attractive in real life. Very. Labels: lydia, stupidity, TV, whuck?